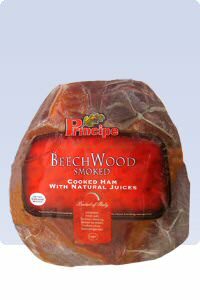 Beech wood hams are cooked in hot-air ovens and patiently smoked on real beech wood; this produces an aroma that is peculiar and specific to this type of ham. Principe is carefully selecting fresh pig legs from which the bones are removed; then they inject the meat with a mixture of water, salt and natural seasonings, the ham is also rubbed vigorously. The ham is then placed in cooking moulds and place into hot-air ovens. Cooking lasts 10-12 hours, depending on the weight and after that the hams are smoked with natural beech wood. The smoking phase is about 2 hours and is crucial in the whole process, as a delicate balance between the natural taste and the spiced seasoning coming from the smoking needs to be reached. This type of ham is a specialty of central Europe. NOTE: Hams are often not exactly the indicated weight; we'll therefore charge your credit card according to the weight of the ham that will be shipped to you. Ingredients:cured with: water, salt, dextrose, flavoring, sodium ascorbate, sodium nitrate.